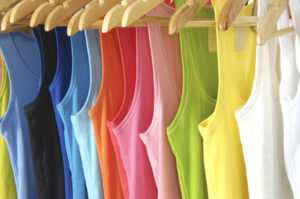 When it comes to a new fashion season, the one thing everyone wants to know is, what are the colors this year? Designers are shaking things up and creating more variety in colors for new seasons. While you’re getting excited about the colors showing up in stores or online, there’s another aspect of color that you may want to consider: the inherent messages of color. Here are some of the color highlights of the season as well as the color messages that are associated with each color. With this added layer of color information, you may decide to experiment with a color because you want to bring certain qualities into your life at this time. One of the fun things to see on the runway this season is the Little White Dress. This year it showed up in the fall/winter collections in dresses, evening wear, oversized shirts and in boots. And it wasn’t always winter white; it was bright white. Message: fresh, reliable, artistic, hopeful and expressive. Amethyst (blue-violet) keeps taking a stand in the color lineup of fashion. It’s a wonderful alternative to the color black if you’re looking for a new basic neutral to add to your wardrobe. It has energy to it and creativity. It’s an easy color to pair with other colors. Message: unusual, creative, artistic, and intuitive. Red was very pronounced on the runways. Strong red dresses, gloves, bags, slip-ons, pumps and red boots make a showing. If you don’t feel comfortable doing head-to-toe red, try adding dabs of it to an outfit. And if you need some energy, wearing red can bring you an energy boost even if it’s in small amounts. Message: high energy, courageous, dramatic, and self-assured. This color showed up in velvet blazers, pants, puffer jackets, coats, onesies, and draped satin blouses and blazers. Add this color to your wardrobe and you’ll feel be seen and appear to be playful and youthful. Or mix it with black and it’s very dramatic. Message: fun loving, enthusiastic, thoughtful, and social. Yellow steals the show in eveningwear, sweaters, feminine dresses, trench coats, and pumps. Whether it’s a barely-there yellow or full-blown canary yellow, it is a powerful color choice this fall. Message: creative, bright, cheerful, optimistic, outgoing. Green is such a soothing color to wear. It feels good to the person wearing it and people around you will appreciate it, too. You can choose to wear a green blazer, puffer vest, pantsuit, satin draped trousers, or a knit dress. It shows up in every type of fabric. Message: friendly, kind, peaceful, helpful and nurturing. Blue comes in many shades this fall. It showed up in soft versions like baby blue and then went toward stronger, brighter, and more saturated shades of blue. It’s a big color in coats, jackets, and suiting. Throw in the denim blues for a bigger sea of blue. Messages: dedication to high ideals, logical, soothing, inspiring, and honest. Designers loved pink and showed it in blush shades for the romantic introverts and stronger shades like hot pink for the dramatic extroverts. It’s a great color to mix in with neutrals or to wear head to toe in eveningwear. Messages: universal color of love, quiet, refined, and artistic.